All offseason long, it was noted that the Utah Jazz had returned 13 players from last year’s roster. The one they didn’t made them pay for it. After Kevin Durant’s go-ahead fadeaway try in the final moments rolled off the rim, Jonas Jerebko, who played for Utah last season, soared in for the winning tip-in with 0.3 seconds left, sending Utah to a heartbreaking 124-123 loss to the two-time defending NBA champion Golden State Warriors in Friday’s home opener at Vivint Smart Home Arena. Donovan Mitchell’s desperation running 3 at the buzzer went off the top of the backboard. Golden State shot 56.3 percent for the game. Durant scored a game-high 38 points on 14-for-25 shooting. Joe Ingles led the Jazz with a career-high 27. The loss was a disappointment, considering the Jazz had been in control for much of the action, but the team was keeping it in perspective afterward. And a really, really, REALLY good first half. When Utah scored 68 first-half points in its season-opening victory Wednesday, well, everyone figured it was because they were playing the perpetually defense-poor and lottery-bound Kings. So when the Jazz scored 81 — yes, you read that right, 81 — first-half points vs. the Warriors … yeah, that was a pretty big deal. That they only scored 42 in the second half proved their undoing. Though the Jazz got off to another stilted start, hitting 9 of 21 from the field in the opening quarter, including going 1 for 8 on 3-pointers, they still held a 34-32 lead, courtesy of a 17-4 advantage in free throws attempted. 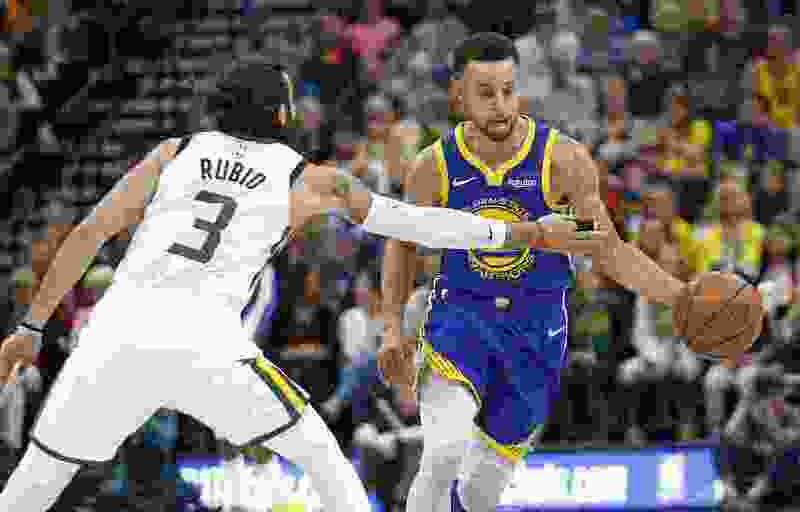 The quarter closed with Golden State’s Durant being whistled for a foul on an Alec Burks 3-point try with 0.1 seconds left, and the Jazz guard converted all three attempts. That play was a little crazy. Things after that, though, were absolutely nuts. An incendiary second quarter saw Utah hit a franchise-record 10 shots from deep and score 47 points — tied for the most ever allowed by the Warriors in a second quarter (along with Atlanta on Nov. 9, 1990). By the break, Utah already had five players in double-digit scoring: Ingles with 14, Rudy Gobert 13, Donovan Mitchell and Jae Crowder 12 apiece, and Dante Exum 11. Two-time Finals MVP Durant did all he could to keep the Warriors close, scoring 24 points on 9-for-13 shooting. And yet, he was a minus-12 on the floor at the time. The most unguardable player in the league would hit a basket, only for Exum to answer with a 3. Followed by a Georges Niang 3. And then a Mitchell 3. The third quarter was less prolific offensively, but no less intense. After Gobert and Draymond Green got tangled up for the second time, words, shoves and technical fouls were exchanged. Later, Mitchell tried to tie Green up along the sideline, and got Green called for a foul on an extended elbow, leading to more unpleasantries. Crowder came to Mitchell’s aid, getting in Green’s face, then hit a 3 on the next possession for good measure, flexing in the direction of the Warriors’ bench as he ran back downcourt. Still, Golden State had too much firepower to go away quietly. Curry finally got cooking, scoring seven straight in one sequence that included one of his patented shimmy-shakes. He finished with 16 in the third quarter and 31 for the game. Still, it was a miss of his at quarter’s end that saved Utah’s momentum. After trimming the Jazz lead from 12 to 3, Curry was forced into a tough try by Exum and Favors. Ingles grabbed the rebound, dribbled across halfcourt, and fired up a long, running 3 that banked home as time expired, pushing the advantage to 103-97 headed into the final quarter. And yet … we’ve all seen this movie before — you count the Warriors out at your own peril. Curry got buckets, Durant got buckets, Green got a layup out of a well-orchestrated timeout play. However, the Jazz did slow considerably — a lack of passing stalling out the offense throughout the second half, as possessions too frequently devolved into isolation 3-point tries. With Golden State up 114-111, Utah re-inserted Ingles into the lineup, and suddenly all was well again for a time. A Gobert dunk. A Rubio 3. Ingles pump-faking the charging Durant on a close-out, side-stepping him, then calmly leaning forward and draining another 3. Back and forth the teams went in the game’s final minutes — a Curry 3 giving Golden State the lead, only for a Crowder putback to return it to the Jazz. All of which set up the finale. Mitchell coming up empty on an iso 3 with 6.1 seconds left. Durant coming up empty on his fadeaway. And Jerebko — the man the Jazz didn’t want — coming through. • Former Jazz player Jonas Jerebko tips in a Kevin Durant miss with 0.3 seconds left to give Golden State the final lead of the game. • The Jazz score 47 points in the second quarter and 81 points in the first half, but only 42 after halftime. • Durant scores a game-high 38 points and Steph Curry adds 31. Joe Ingles leads Utah with 27.